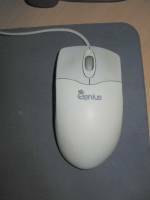 Having used my silenced rodent for nearly 1/2 year at home, I finally decided to get rid of the clicking noise at work too and here's the how-to. Some people wanted me to translate the original article, but I guess it's better to start afresh with a revised and simplified approach. I'm not going repeat reasons for silencing mice, if you want to do it, you probably know why. If you don't know why, then just assume there are people who hate the clicking sound. 1. 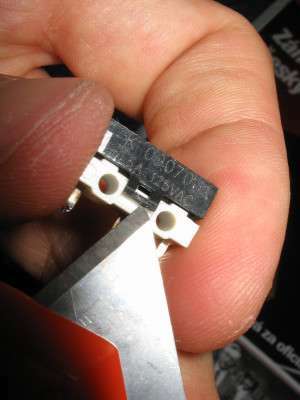 Disassemble the mouse. Now you can see the three switches that make more than 90 % of the noise (the 10 % are made up by resonance in the plastic body - I tried to fill it with some silencing material, but got no audible difference). 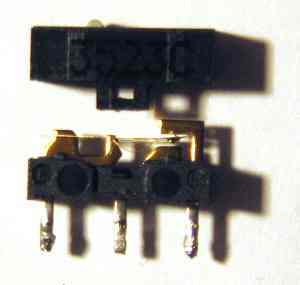 My method is only possible with this type of switch, if you see other type in your mouse you'll probably have to invent something else. 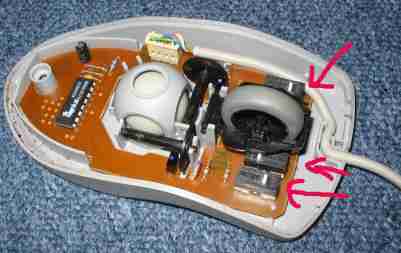 This is the case of middle button of Dell mouse (green circle above). 2. Take notes on the position of white switch buttons. 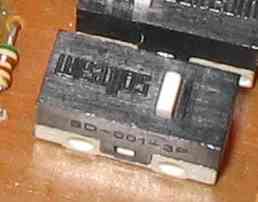 This step is probably unnecessary, as this seems to be always marked on the pcb's. 3. 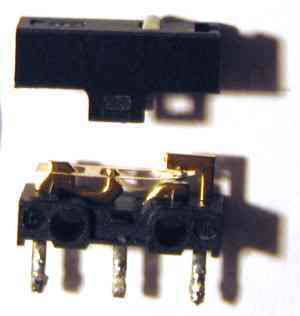 Carefully solder out the two outer switches. In my first attempt I silenced also the middle switch, which turned to be a bad solution. The switch became too sensitive and could be triggered by mere scrolling. I use the middle button rarely, so I left it noisy in the end; but if you do use the middle button often and therefore wish to hush it too, try it, you have been warned. 4. Open the switch by carefully lifting the legs (perhaps there's better word for it) on its sides. It's wiser to put the switch upside down beforehand, so that the tiny white plastic button won't fall out. It's not a serious problem if you manage to break the legs - just glue the parts together afterwards - or forget it completely and take the risk of mouse malfunction in extreme conditions (e.g. earthquake). 5. Turn the switch cover by 180 degrees and join it with base again. What is the purpose? This way the point where the button touches the spring is shifted and somehow the spring now moves gradually rather than at once. 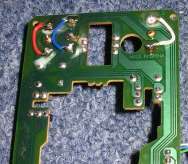 The switch lids of the Dell mouse were a bit different, there wasn't enough room to fit the switch after rotation, so I had to make more space with hot solder gun. 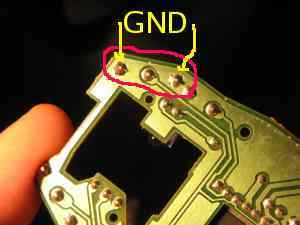 With other type of mouse double check the schematics on how the pins are used. 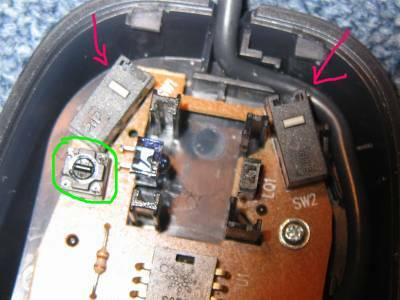 The Dell mouse has both outer pins grounded, so there's nothing left to do. 8. Reassemble the mouse and enjoy. You can check recorded sound of clicking before and after. FYI, the sounds are of the Genius mouse, but trust me, the other one is dead silent too, I was just too lazy to record it. The disadvantage is, that the actual clicking is perhaps not as distiguishable or maybe accurate (no audio feedback in fact), but it's just a matter of getting used to. Other ways I have tried consisted of shortening the distance the spring has to travel, but the noise reduction gained was not satisfactory for me..
Also the mouse buttons are now more sensitive, so you'll get a few false clicks in the first couple of days, before you learn how to handle it.